Dr. Brian Brazzo is a board-certified ophthalmologist and a fellowship-trained plastic surgeon. His practice is devoted to the most advanced techniques in ophthalmic plastic surgery. He is a graduate of the Harvard Medical School and University of Pennsylvania. He completed a transitional residency in medicine and surgery at Thomas Jefferson University in Philadelphia. Dr. Brazzo then completed a residency in ophthalmology at the Manhattan Eye, Ear & Throat Hospital in New York. He spent an additional three years training in ophthalmic and facial plastic surgery under some of the most prominent surgeons in the country. He completed his thesis and gained the highest standing in the American Society of Ophthalmic Plastic and Reconstructive Surgery. Dr. Brazzo is currently an attending surgeon at the New York Eye and Ear Infirmary and the New York Presbyterian Hospital, as well as a consultant at Weill Cornell Medical College. 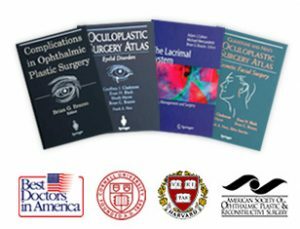 Dr. Brazzo is active in ophthalmic research, and has edited six medical textbooks. He is a featured lecturer and author of numerous articles and papers. He is recognized as one of the most experienced cosmetic and oculoplastic surgeons New York has to offer. Clinically, he specialized in the care of patients with cosmetic and reconstructive concerns of the area around the eyes, including the eyelids, orbit and lacrimal systems. He has performed cosmetic surgery on some of the most famous names in the entertainment industry. A revered oculoplastic surgeon who patients trust with all their ophthalmic plastic surgery needs, Dr. Brazzo skillfully performs blepharoplasty (eyelid surgery), ptosis treatment and various non-surgical cosmetic procedures such as Botox and facial fillers in New York City. He also helps his Manhattan Latisse patients grow thicker, longer eyelashes. ©2019 Brian G. Brazzo, M.D.